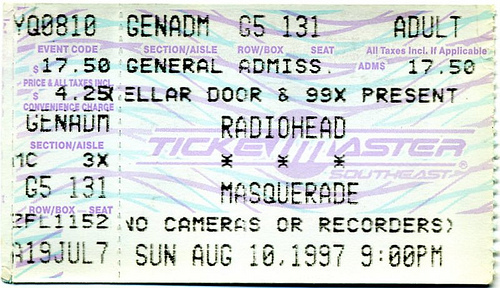 The last time we here at GP saw Radiohead in Atlanta was in 1997 and a lot has changed since then. At that time, Jonny was often seen running the lights for the opening act, and Thom didn’t have a ponytail. OK, OK, we’ll stop with the hatred toward Mr. Yorke’s current hair situation. Tonight the band returns to Atlanta after last night’s stop in Tampa to play Philips Arena. Y’all have fun tonight now, ya hear.